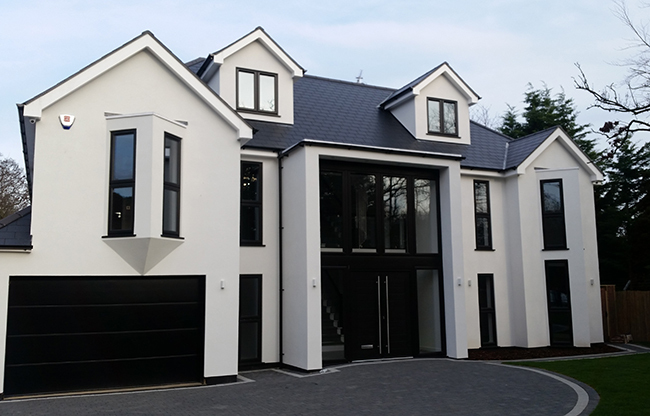 Hayes Lane was a new build with an exciting design and a good budget. The project had many challenges and complications with regard to the footings, steel beams sizes and roof structure. The plan was to demolish an existing 1930 three-bedroom house and replace with a new 5-bedroom modern house in just 24 weeks. Each of the five bedrooms have their own ensuite plus a high spec family bathroom, including bidet and jacuzzi, beautiful porcelain tiles add to the luxury feel. The downstairs accommodation includes a beautiful open plan kitchen diner, utility room, and cloak room, two Aluminium bi-folding doors and windows make the best use of the available light and allow access to the landscaped garden. Under floor heating powered by a mega flow boiler is installed throughout the house.